Can't help but weep reading this post. It's all very familiar. You put all my feelings into words. You have an amazing family! Thanks for the post, I can always count on a giggle and tender family moments. Hang in there! Love ya! Erin, I am crying as I read this post. If I was on the edge already, the baggie of oreo creme did me in! Crying for you as the Mommy who wants to be there and strong for your kids but I know it is so hard on you...and crying for your sweet kiddos who I know are missing their Daddy already. Prayers and hugs coming your way. WOW!! What a post. 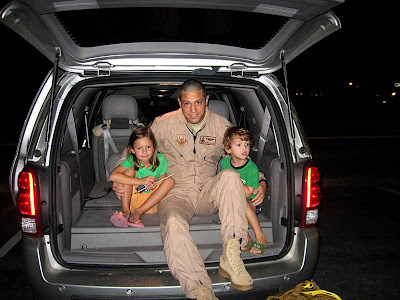 I am in awe of Josh and your family.......(times ALL of our military and their families). What a tremendous sacrifice. I so love to read the 'love' in all that you write.....for the Lord, your sweet husband and your precious children. You have many praying for you and yours!! Oh the oreos would have put me right over the edge. I sent you an email. I too, am crying as I read your post. Hits close to home. Thanks goodness, indeed, for skype and email. Good luck in your upcoming months as a "single parent" I am praying for your strength to get through the days and months without your other half. Also praying for all of the guys in Josh's unit to do their duty as safe as possible. who would have thought that a baggie of oreo middles would send so many women into a crying jag? how you women can keep it together for the sake of your kids astounds me! Bummer that Day 1 is here. Hopefully yours went better than ours (invading ants when we returned for breakfast and puking child at night)!! It's really only 180 days? J has travel to and from time added on. Only time in country starting at a predetermined time started the clock. But, at least they are not up to a year yet - right? Praying, praying, praying as you adjust to new routines and rhythms. And thank you for reminding me to get all of J's shoes out of the closet when we get back! Well, Erin, I am a weepy mess. That dang bag of Oreos put me over the edge, too. Prayers for your family as you start this difficult yet necessary stage of life. It sounds so trite, but I truly do appreciate the sacrifices you & all military families make for our country. I can't even imagine. You had a wonderful send off for him and the oreo middles is so romantic!! Twice this week I've teared up at your blog!! Crying over your family's situation and Oreo fillings. Only Josh would be so meticulous and thoughtful for your parting gift. I'm imagining him sitting there twisting each one for you. He's a good egg. Oh boo. It really happened. Loved the oreos! I'm sorry Erin... I know how hard it is. And Kaci and Alex are the same age so it's hard for them. We had a really rough first few days. Alex is lucky to have you for her mommy :) Be strong for her. Sending hugs! And remember it's always ok to add a road trip to the desert! Thanks for making me cry at 5:30 in the morning. Prayers for you and your family...and hoping 180 days goes very fast! Oy vey. Here already? I'll be lifting your spirits up in prayer and Josh's too b/c no doubt he's dearly missing his 3 favorite people. You are all so incredibly brave. I found your blog via The Lumberjack's Wife and have been following with tears and smiles ever since. Will definitely be praying for strength and peace for you and your babies and safety for your husband! I'm thankful to him and your family for serving our country.